When Australians travel we like to explore the unfamiliar. We’re quick to purchase the latest gadgets and we crave international brands. In the corporate world, many professionals consider themselves global citizens, travelling abroad for work and play. So why is it that when it comes to investing, we’re biased, preferring home territory over the opportunities the rest of the world offers? In direct conflict with the widely accepted benefits of diversification, home bias is the tendency for investors to invest a large proportion of their portfolio in domestic equities. Research1 has found that there are typically five reasons why Australian investors suffer from a home bias, including; a preference for the familiar; currency risk; global geopolitical risk; tax complexity; and the perceived difficulty and costs of accessing the global market. This is understandable, especially when one considers the benefit of Australian franking credits and the fact that the ASX tends to be one of the highest yielding stock markets in the world. 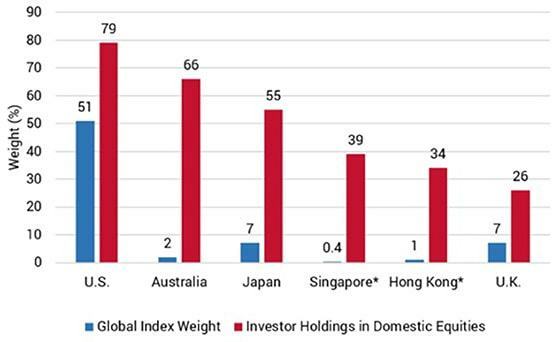 *Singapore and Hong Kong domestic equity holdings based on Eastspring Investment Asia Investor Behaviour Study 2015. Despite comprising only 2% of the world’s equity markets, Australians put 66% of their money into ASX-listed stocks. Only the US, with a far deeper market and many internationally-orientated stocks, features a higher degree of home bias. For the last 15 years, this has all worked out swimmingly. The Australian equity market has outperformed global equities by more than a factor of two. But, as we know, past performance is no indication of future returns. What this outperformance masks are the risks taken to achieve this return. Few investors know that just two sectors – financials and resources – make up more than half the ASX’s total market capitalisation, and that the big four banks comprise nearly one third of it. In Australia at least, home bias is effectively a bet on the residential property market. The big four banks, so loved by the market for their high yields and franking credits, have loan books that are more than 60% weighted to the residential market – more than double the ratio in the US 2. We’ve written previously about the over-exposure of Australian investors to this sector. For an economy that’s enjoyed a recession-free run for a world record 26 years, this is a substantial risk. Nor is home bias a result of an information or education deficit. We all know the old adage ‘don’t put all your eggs in one basket’. Diversification lowers risk. Unfortunately, the human brain is wired to lose money and not diversifying is one of the ways we do it. Many of us know that a globally diversified portfolio spreads risk among a number of economies with a greater number of stocks and industry sectors. But following the wisdom of diversification is easier said than done, especially when home bias has served Australian investors so well. But what if you now want to better manage the risks embedded in home bias? There is no one-size-fits-all in terms of how a portfolio should be constructed. An investor’s circumstances, goals and risk appetite are all important considerations. But the fact remains – too many investors are over-exposed to the Australian economy. Having done so well for so long, we’re minimising the apparent risks in our own minds but not in reality. So this is a call for a reality check. Have a look at your portfolio and ask yourself whether you’re suffering from home bias. If so, you have plenty of options. There are a plethora of funds that now offer cheap and quick access to international markets. Either way, it’s time for Australian investors to view their investments in the same way they do their work, holidays and shopping – with a more international focus. Check out the APN Property Group blog for more articles covering a range of real estate investment topics. This article has been prepared by APN Funds Management Limited (ACN 080 674 479, AFSL No. 237500) for general information purposes only and without taking your objectives, financial situation or needs into account.